It can be hard to figure out the difference between your intuition and normal thoughts. But I promise it will get easier as you practice and learn to tone in. Intuition is often a gut feeling, it comes out of no where and you feel it in your body. Which is quite different than just a normal thought. I don’t feel my normal thoughts. Intuitive thoughts come with powerful feelings or emotions that leads you in a certain direction. Often it is not logical but feels like it is leading you in the right direction. Intuition is loving and speaks kindly. You can use the following practices to help strengthen and develop your intuition. When you get into a creative flow the chatter in your mind transitions to stillness. Being creative also puts you into a flow state where it is easier to connect to your intuition and hear its guidance. Make time in your schedule for anything that gets your creative juices flowing. Dancing, painting, making jewelry, singing, playing music, writing, sculpting, scrapbooking, photography are just some ideas. I was drawn to painting but I had never painted before in my life. I actually had a story that I somehow created or picked up when I was a little girl that I was not creative or artistic. Because of this, the idea of painting was super intimidating, but I choose to do it and move beyond my fear. Being creative isn’t about being good at something. It’s just about flowing and seeing where it takes you. I am not the best painter ever, but It is something I actually really enjoy now and helps me connect to my intuition in a totally different way than other practices I do. Go with whatever you feel most drawn to and start there. Trust yourself and take the leap, your intuition will thank you. Meditation has been scientifically proven to decrease anxiety and stress which get in the way of connecting to your intuition. It also has been proven to improve introspection, increases compassion, and emotional intelligence which all help to develop intuition. Before I started meditating consistently my mind was going 1000 miles a minute I was constantly flooded with thoughts and ideas. At the very rare times that I was able to receive messages from my intuition, I was very skeptical of the guidance I was receiving, because it was so different from my thoughts. Because of my skepticism, I would most often end up ignoring the intuitive messages I was receiving. often ignoring my intuition landed me in less than desirable situations. Once I started meditating regularly this really changed. My mind began to slow way down and became much calmer. As a result, it was so much easier to relieve the messages from my intuition. I know the idea of starting a meditation practice can feel Overwhelming but it doesn’t have to be. You can learn more about how to start your meditation practice in a way that will make it easy to stick with here. There is something quiet and calming About spending time in nature that makes it easier to hear the guidance from your intuition. Try going on daily walks or simply sitting outside and grounding yourself with the Earths energy. Make sure you are present when you do this. Don’t bring your phone or other electronics. Use this time to be present and notice what thoughts feelings and emotions come up. When you are feeling stuck or unsure of what to do ask yourself for guidance. Be specific about what you are seeking guidance on. Then take a few deep breaths, close your eyes, and be still. Give yourself time to relax and open to relieving what you are asking for. You will know that it is your intuition and not something else because it will always come from a place of love. Never from a place of fear. This is something I do on a very regular basis. Pretty much on the daily. Sometimes I get answers right away and sometimes it takes a little bit longer. So don’t get discouraged if you don’t get an answer right away. There is nothing more that your intuition wants than to guide you in the direction of your soul’s evolution. One of the best ways to strengthen it is to take action on its guidance. I am sure you can recall times in your past when you have listened to your intuition and times when you have not. if effect back on those experiences to help you identify what it felt like to relieve messages from your intuition. Doing this will help you become more sensitive and aware of what your intuition feels like. Making it easier to identify and listen to it when it sends you messages now and in the future. The more you listen and act on the guidance the stronger your intuition will become. When we are stressed our minds tend to work overtime. One of the huge contributors to stress is the constant connection to phones. Social media, email, and to-do lists. It is important to find ways to de-stress and unplug if you are serious about developing your intuition. Find pockets in your day where instead of checking email or social media accounts you choose to unplug and connect with yourself. This could look like closing your eyes and taking a few deep breaths instead of scrolling through Instagram. You could also use this time to think about things that you are grateful for. Gratitude works wonders on stress. I schedule in time for being unplugged into every day. I do not go on my phone or computer until I am finished with my morning rituals. I also make sure that I am off of all devices at least an hour before I go to bed. Unplugging in this way has helped me greatly reduce my stress levels while connecting back to myself. As a result, my intuition has grown a lot. Journaling is freaking amazing! It is one of the best ways you can strengthen your intuition. There is no right or wrong way to journal. I have made journaling part of my morning rituals. It is so powerful that when I make the unwise decision to skip my journaling practice in the morning I totally notice that it impacts my creativity, my productivity, and my workflow. Journaling is a great way to get out of your head and connect with your intuition. There is something that happens through the writing process That connects you to yourself and your intuition on a much deeper level. You can try free writing and just go with whatever comes to the page. Or maybe you want to try asking yourself a question and see what answers you get. You can even find journals with prompts to help you go deeper. I designed this journal to help people who are starting out on their spiritual journeys. What’s important is that you find what works best for you and you stick with it. 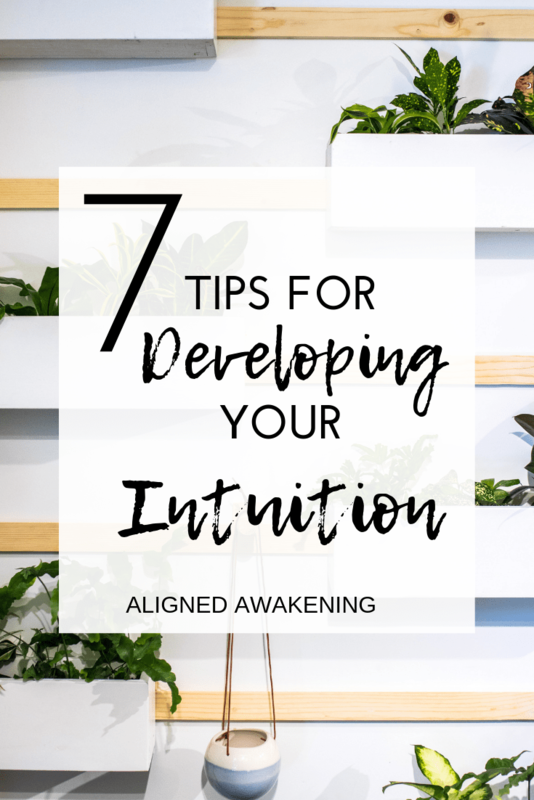 over time doing these seven things will help you develop and strengthen your connection to your intuition. Want Support & Community on Your Journey? Yay! I am so glad that you found them to be helpful! I look forward to hearing how your meditation practice grows and evolves! I love this post. You inspire me to meditate more. I am so glad that it resonated with you and that you are going to meditate more. I know that meditation has helped me so much on my journey by connecting to myself my intuition and to the universe. Sending tons of good meditative and intuitive vibes your way! Thank you Marie! I love journaling so much it is part of my daily routine. I even find myself journaling more than once a day when I am really working through something or feeling guided to journal for more clarity. Beautiful, beautiful, beautiful post! I tell these things to myself sometimes, but it’s good to be reminded of these things from other people. Thank you! Thank you for your kind words Suzan! I am so happy to be able to remind you of the truth you already hold for yourself. Sending much love your way! Meditating twice a day really made my life so much better. I feel like space was created between my thoughts and myself (if you know what I mean). 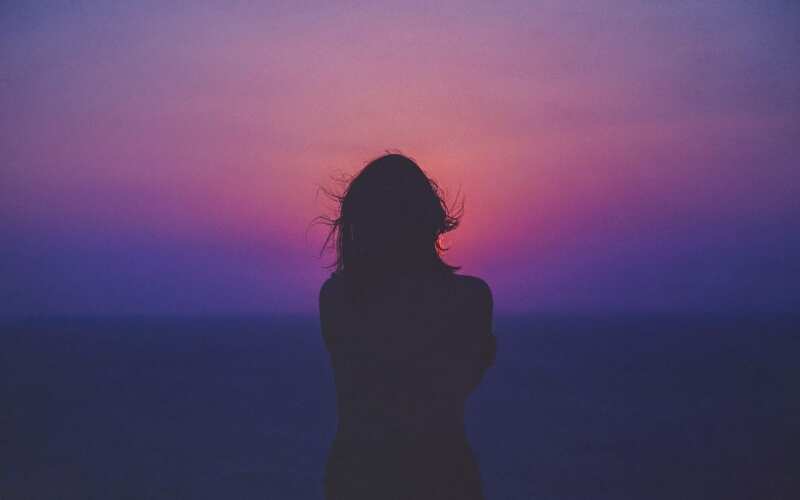 It is as if I was able to recognize I´m not the voice in my head and that most of what it says is based on fear, not love and trust so it is okay to go against it when my intuition is telling me something different.